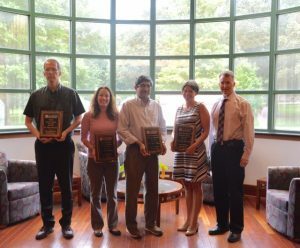 The University of Mississippi School of Pharmacy honored four of its faculty members for their excellence in and commitment to research, teaching and service at its annual faculty retreat in June. Left to right: Robert Doerksen, Katie Barber, Ikhlas Khan, Donna West-Strum and Dean David D. Allen. Dr. Donna West-Strum, professor and chair of Pharmacy Administration, won the Faculty Instructional Innovation Award for her role in creating and implementing the teaching tool Educating Pharmacists in Quality, or EPIQ. This resource uses cutting-edge techniques to train pharmacists and pharmacy students to measure and improve quality in pharmacy practice. Along with two other pharmacy quality experts, she received a grant from the Pharmacy Quality Alliance (PQA) to answer the American Association of Colleges of Pharmacy’s call for increased education on pharmacy quality. The program is made available for free on the PQA website, and has been incorporated into over 20 doctoral curricula, including her own. In October of last year, EPIQ won the Duncan Neuhauser Award for Curricular Innovation from the Academy for Healthcare Improvement. 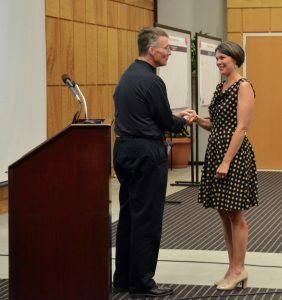 Donna West-Strum receives the Faculty Instructional Innovation Award from Dean David D. Allen. Dr. Robert Doerksen, associate professor of medicinal chemistry, was awarded the Faculty Service Award for going above and beyond to support the school through service. He participates in a large number of dissertation committees each year, and advises students on their career paths and research. He peer-reviews roughly one journal article per month, and is also a resource for Taiwanese students with the Mississippi Taiwan Students Association. At the University, he is a faculty advisor to several organizations, including the local chapter of the American Association of Pharmaceutical Scientists, and has represented the School of Pharmacy to the Undergraduate Council. As chair of the Scholastic Standards Committee, he participated in reviewing applications to the school of pharmacy and interviewing prospective students. 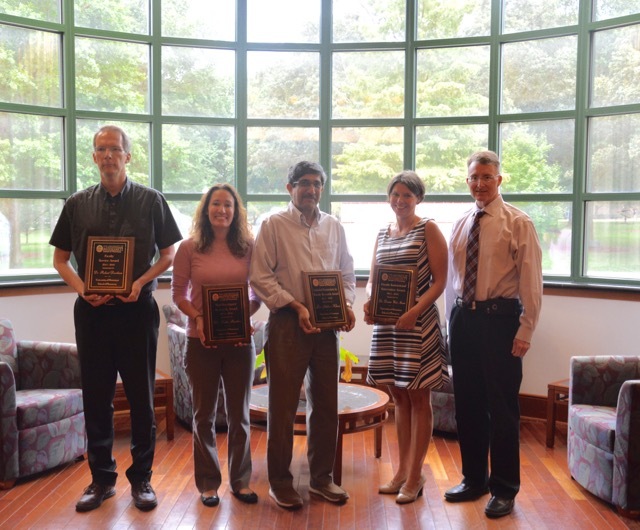 Dr. Ikhlas Khan, associate director of the National Center for Natural Products Research Center, won the Pharmacy Cumberland Pharmaceuticals, Inc. Research Award. Dr. Khan is also the director of the FDA Center of Excellence, a research professor in the Research Institute of Pharmaceutical Sciences, professor of pharmacognosy and director of the Sino-US TCM Research Center. Additionally, he serves as the coordinator of the National Products Research Center for Water and Wetlands Research and the director of the University’s Center of Indian Systems of Research of Indian Systems of Medicine. Dr. Khan conducts research that contributes to ensuring the quality and safety of botanical dietary supplements. He has contributed to more than 600 research articles and presented over 100 invited lectures all over the world. He has won many prestigious awards, including one for Outstanding Contribution in Natural Products Research from the Center for Food Safety and Applied Nutrition. Dr. Katie Barber won the School of Pharmacy New Investigator Award for her work with infectious diseases. Dr. Barber has completed two ASHP residency programs in infectious diseases and contributed to 20 peer-reviewed publications. In 2014, she won the Young Scientist Travel Grant Award from the European Congress of Clinical Microbiology and Infectious Diseases. Ralph Didlake was the keynote speaker for the retreat. He is the Associate Vice-Chancellor for Academic Affairs and the Chief Academic Officer at UMMC. 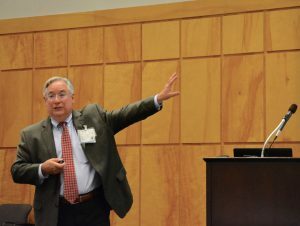 The Associate Vice-Chancellor for Academic Affairs and the Chief Academic Officer for the University of Mississippi Medical Center, Dr. Ralph Didlake spoke as a guest to the faculty about his specialty of bioethics and medical professionalism.